Whether you are learning to ride a motorbike and this is your first one, or you’ve been riding a while and want to keep your bike in tip-top shape, these tips will help minimise your breakdowns and improve your riding safety. They only need to be done once a month and take just a few minutes, and they’ll help you see potential problems before they become actual problems. These checks are quick to do and need no specific mechanical ability. Apply each brake fully and check that it locks the wheel. The brakes should be able to be applied fully without using the full travel of either the lever (front brake) or pedal (back brake). 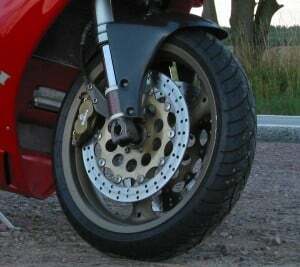 The brake pad shouldn’t be touching the disc when the brakes are not applied; you will probably notice if this is happening because the brakes will get hot when you are riding and you might smell them burning. Look for any cracks in the brake discs. If you notice that the brakes pulse when you apply them the brake disc might be a bit warped, which can happen if they overheat. You will need to have a mechanic look at this. Your lights are your prime means of being visible to other vehicles, as well as being able to see where you are going at night. 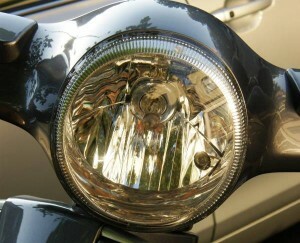 Check that your main headlight works on normal and full beam. Test each indicator – faulty indicators put you at risk because other vehicles won’t be able to tell what you are doing. Check your rear light and your brake light – a faulty brake light puts you at risk of another vehicle running into you from behind. While you’re messing around with the lights, check the horn, too. Most bikes are chain-driven and this chain needs to be lubricated and be at the right tension. 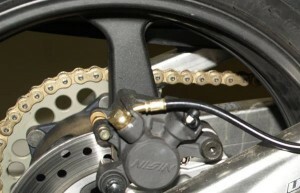 A typical chain tension will allow you to move it around 30mm. Look in your service manual to find the right tension for your chain and if it’s too loose you can tighten up the slack using the adjusters at each end of the swing arm. Your chain will go slack over time. If the chain is dry, use aerosol chain lube, but be careful you don’t get it on your tyres. Check the chain for any obvious signs of wear. If your tyres are not inflated to the manufacturer’s specified level then you risk them overheating because they deform more under the pressure of riding. If they are over-inflated then you will have less grip on the road because less of the tyre is in contact with the road surface. Check that there are no cuts in the tyre, stones caught in the tread that can wear into weak spots, and no bulges on the sides of the tyre. 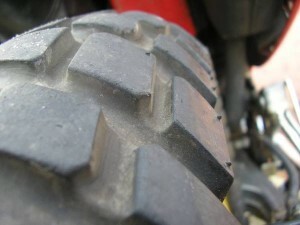 Check the tread depth is more than the minimum 1.5mm. Tread less than 3mm will cause an exponential decline in your wet weather handling so it’s best to get them changed early. The coolant will only usually be low if there is a leak. Check that it is between the minimum and maximum level marks. Check the manual or online if you need to purchase more coolant to top it up. Check both the engine and transmission oil. The bike needs to be cold and upright on level ground before checking it otherwise it could read incorrectly. If your motorbike has an inspection window for the oil it’s easy to check; if it doesn’t, use the dipstick to check the oil level. Take the dipstick out, wipe it off, put it back in again and then remove it once more to get a reading. If it’s near the minimum, top it up, but don’t put too much in. If the oil is black or very dark it needs replacing. Keep the brake fluid topped up to the maximum line. The type of fluid required will either be embossed on the reservoir cap or in the manual. Your motorbike will have a service schedule based on time and/or kilometers ridden. More detailed checks are required at this time and you can either take it to a mechanic or, if you have a few tools and a willingness to learn, do it yourself. Depending on the design of the filter, it might be able to be cleaned. Paper filters can be tapped to dislodge dust, but foam ones need to be washed in solvent and dried properly. Spark plugs wear over time by becoming corroded. The spark plug gap can also change over time. Use a feeler gauge and adjust them back to the proper gap. Poorly adjusted spark plugs will reduce your power. Changing the oil can be messy. Place a tray underneath the sump and remove the drain plug. The oil will drain into the tray. Dispose of it responsibly (definitely do not put it down the drain). Replace the filter by unscrewing the old one and screwing in a new one. Check that the washer on the drain plug is in good condition. Replace the plug carefully – if you cross-thread it then it won’t hold the oil. Add new oil to the recommended level. Check that your clutch still bites well and that you are still able to make smooth gear changes. If this isn’t the case it could be that the cable has stretched, in which case you can use the threaded adjuster and locknut for the clutch lever. If the clutch is wearing out this is a more complex job and you should take your motorbike to someone that knows what they are doing. Brake pads wear over time. Thin brake pads overheat more quickly and can’t dissipate the heat built up while braking. Look down the side of the brake calliper and you should be able to see how much pad is remaining. Your brakes should last quite a while if you are driving carefully and using acceleration sense (coming off the throttle early and changing down through the gears to preserve your brakes). If the pads need replacing you will need tools to get them out of the callipers and get the callipers off and on the wheel. If you don’t know what you are doing, it’s best to take it to a mechanic. This video explains the process of changing the pads in a front brake calliper. 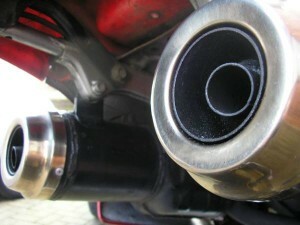 Your exhaust shouldn’t have any holes or cracks in it and shouldn’t exceed the legal decibel limit. If it has an engine capacity of 125cc or less, this is 96dBA, and if it has an engine capacity of more than 125cc it is 100dBA. Check the mounting brackets for the exhaust and see if they are firmly held in place as you don’t want your exhausts rattling around. Moving parts that are exposed to the elements, like the clutch lever, brake pedal, gear change lever, cables and stand will need occasional regreasing/oiling to keep them moving smoothly. Just take care not to get oil on your pegs, brake discs or tyres.